Our program,"The Creative Curriculum (TM)" is recommended by the N.C. Division of Child Development and is used in all classes. Our curriculum provides stimulation through a variety of visual, aural and personal connections. Our infants are grouped by age and developmental stages. Teachers are not only warm and responsive, but educated in working specifically with infants. Daily reports are written for each child so that you know what kind of day your baby has had. We know that a safe, loving and clean environment are important to parents. That is exactly what you will find at Lollipop. This age group has learning centers that consist of art, science, library, blocks, puzzles, music and dramatic play. 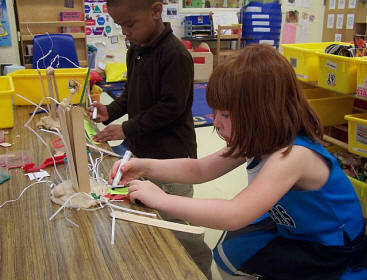 Twos explore their world through play, social interaction and teacher directed activities. A playground specifically for twos is just outside their classroom door. This is the perfect place for twos to burn up their seemingly never ending energy. Water play, climbing toys, riding toys and nature are all enjoyed here. Our Transitional Kindergarten program prepares your child for "big school". 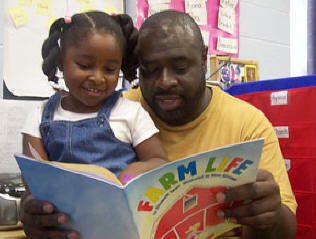 Literacy is essential for success in school and life. Skills such as listening and speaking, early reading, early writing and math are all part of our curriculum. While every child learns at their own pace, the exposure to early literacy skills lays the foundation for life-long learning. Art, music, books, outdoor playtime fill the days of our Toddlers. This age is curious and exploratory by nature. We begin teaching self-help skills like hand washing, using the potty and dressing themselves at this stage of development. Toddlers enjoy their own playground designed specifically for them. Here they can enjoy riding toys, water play, climbing, rolling balls, watching squirrels jump from tree to tree and listening to the birds sing. This age is the beginning of a special stage in your child's life. They are learning more about independence and self-confidence. Three year olds are developing a strong sense of themselves and the world around them. We help nurture this process through 4 areas of development: social/emotional, physical, cognitive and language. As stated in the Creative Curriculum (TM), "through the activities we plan and the way we organize the classroom, select toys and materials, plan the daily schedule, and talk with the children, we seek to accomplish the goals of our curriculum and give your child a successful start in school. 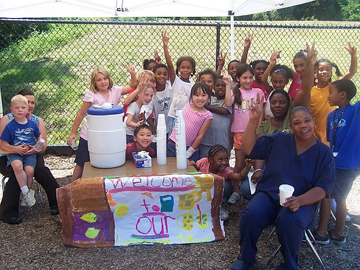 We provide after school care for children grades K - 5th. Transportation is provided to and from River Gate, Lake Wylie, and Palisades Park Elementary Schools only. Afternoon snack and homework assistance as well as adult supervised play time are part of our daily program. Children are grouped by age in two separate classrooms. Kindergartners through 2nd graders are in one group while 3rd through 5th graders are in the other. Two adults are working with each group so that each child gets individual attention. We also provide full day child care during teacher workdays and student holidays.